Directed and edited by Michelangelo Antonioni and screenplay by Antonioni and Gerard Brach with contributions by Tonino Guerra from a story by Antonioni, Identificazione di una donna (Identification of a Woman) is the story of a filmmaker trying to find the right actress for his next film as he embarks on having affairs with different women during the course of his search. The film is an exploration of a man trying to deal with the recent dissolution of his marriage while turning aspects of his life into film. Starring Tomas Milian, Daniela Silvero, and Christine Boisson. Identificazione di una donna is an evocative yet haunting film from Michelangelo Antonioni. The film follows a filmmaker who is trying to get started on a new film but has a hard time finding the right woman to play the lead as he copes with the dissolution of his marriage and creative issues where he would embark on two different affairs with two different women who would make an impact in his life. It’s a film that revolves around a man trying to understand his own faults with women as he would try to find the idea of the ideal women during the course of his own existential journey of sorts. The film’s screenplay by Michelangelo Antonioni and Gerard Brach has this very odd structure in the way it follows the character of Niccolo (Tomas Milian) who is working to create a new film as he would meet a socialite in Mavi (Daniela Silvero) in which he would have a relationship with. Much of the first act is about Niccolo’s relationship with Mavi where he is fascinated by her beauty but has a hard time dealing with the cliques she’s in. The second act is about the relationship coming apart but also Niccolo’s search for Mavi once she leaves him as he would meet an actress named Ida (Christine Boisson) early in the film’s third act. She presents a completely different idea and personality in comparison to Mavi as she is more earthly and humble as opposed to the more bourgeoisie Mavi. Still, he is obsessed with finding more about her as he would also cope with the fact that his idea of the ideal woman for his film is really just a fantasy. Antonioni’s direction is definitely ravishing for the way he explores a man’s own sense of isolation and sense of not knowing as he wanders around Rome and nearby locations including Venice as it play into Niccolo’s own journey into finding his muse. 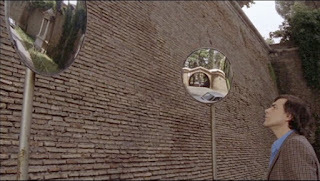 Antonioni’s approach to compositions and imagery is key to its approach in Niccolo’s view of the world though it starts off sort of comical where he gets into his home only for the alarm to be turned on. It’s among the few instances of humor that Antonioni would put in throughout out the film yet he prefers to understate the drama as it’s more about Niccolo in these different environments whether it’s at this very posh yet dull party where everyone is full of themselves or at an aquatic center watching a swimmer he thinks he might cast for his next film. Also serving as the film’s editor, Antonioni would create some rhythmic cuts for the film but mostly prefers to let the shots linger for a minute as it’s all about Niccolo reacting toward his surroundings which includes this chilling yet gorgeous scene set entirely in a fog. The fog sequence is one of several moments in the film that play into the sense of the unknown where it’s frightening for the fact that Niccolo and Mavi are both trying to hide from a stalker that is after Niccolo for some unknown reason as it is a bit of a metaphor for their relationship which is often unpredictable. By the time the film’s third act emerges, Antonioni would go into some carefully-precise compositions that include some unique crane shots and shots looking up as it play into Niccolo’s own search for Mavi but also his own revelations about his obsession towards her and how he’s becoming attached towards Ida. Yet, there is still a melancholia in Niccolo as he reacts to the world around him and wonders if he does have something to offer to women in an emotional and romantic level. Overall, Antonioni creates a provocative yet intoxicating film about a man’s search for the ideal woman for both his film and in life. Cinematographer Carlo di Palma does brilliant work with the film’s cinematography with its emphasis on colors for some of the interior scenes at night including the usage of exterior lights for scenes at night as well as the approach to low-key lighting for the fog sequence. Production designer Andrea Crisanti and set decorator Massimo Tavazzi do excellent work with the look of Niccolo’s apartment as well as the country home he would take Mavi to as well the parties hosted by some of Mavi’s friends. Costume designer Paola Comencini does fantastic work with the costumes as it is mostly casual with the women wearing mainly some stylish clothing. The sound work of Mario Bramonti is amazing for its intricate sound design to capture some of the atmosphere of the locations including the fog scene as well as a few social gatherings and quieter moments in the film. The film’s music by John Foxx is superb for its electronic-based score that is a mixture of ambient, jazz, and new age music that is often played on location while music supervisors Dante Majorana and Lia Scarpa would maintain that mixture of electronic music, Italian pop, and classical with contributions from the former as well as acts such as XTC, Tangerine Dream, Orchestral Manoeuvres in the Dark, Steve Hillage, Japan, Gianna Nannini, Mercenaries, Fausto Cigliano, and Edvard Grieg. The film’s incredible cast feature some notable small roles and appearances from Itaco Nardulli as Niccolo’s nephew Lucio, Sandra Monteleoni as Mavi’s sister, Dado Ruspoli as a lover of Mavi’s mother, Veronica Lazar as Niccolo’s sister Carla, Marcel Bozzuffi as the mysterious stalker, Enrica Fico-Antonioni as a friend of Mavi in Nadia, and Lara Wendel as a young woman at the swimming pool facility who reveals something to Niccolo about Mavi. Christine Boisson is amazing as Ida as a young stage actress who would provide a sense of grounding and optimism in Niccolo as well as be someone who is quite lively as well as have a sense of compassion. Daniela Silvera is brilliant as Mavi as a socialite who becomes Niccolo’s new lover as someone who is quite ambiguous in her activities as well as be someone that is vain at times but also carry secrets of her own. Finally, there’s Tomas Milian in a marvelous performance as Niccolo as a filmmaker who is dealing with the aftermath of his divorce as he tries to find the ideal woman for his film while coping with his own flaws as well as the uncertainty over what story to tell for his next film. The 2011 Region 1/Region A DVD/Blu-Ray from the Criterion Collection presents the film in a new high-definition digital restoration in its original 1:85:1 theatrical aspect ratio in Dolby Digital mono in Italian with new and improved English subtitles. Though the DVD/Blu-Ray’s lone special feature is the theatrical trailer, it does come with a booklet that features an essay and an interview with Antonioni by film critic Gideon Bachmann. The essay entitled The Women in the Window by film critic John Powers doesn’t just talk about the film and its themes but also Antonioni’s own comments on how women are depicted in the era of post-women’s liberation movement. Powers also talks about Niccolo’s own existential journey and the alienation he is dealing with towards the new Italy with its sense of modernism and what he wants in a woman. Powers definitely does a compare/contrast toward both Mavi and Ida in how they present themselves as well as showcase scenes that show their true selves in front of Niccolo as he ponders his own faults as well as wondering if everything he’s looking for is just a fantasy. The second piece of text entitled A Love of Today for the summer 1983 issue of Film Quarterly is an interview with Antonioni by Gerard Bachmann conducted on July 22, 1982 just a few months after the film’s premiere at the 1982 Cannes Film Festival where it won the festival’s 35th Anniversary prize. The interview has Antonioni talk about his methods into storytelling as well as his ideas of making film where he prefers to document something that he had seen rather than make something up. He also talks about audiences’ interpretation of the characters and situations which he is glad that people are willing to make interpretations as he also share his own views on the characters in the film. Antonioni also discusses about the ideas he’s made and what he was supposed to do next which was supposed to be set on the sea near America as a way to explore human emotion and such. Unfortunately, that film would never be made due to a stroke Antonioni would have in 1985. Yet, the interview is a fascinating read to gather the thoughts of a filmmaker late in his career as he still had something to say. Identificazione di una donna is a phenomenal film from Michelangelo Antonioni. Featuring a great cast, gorgeous visuals, hypnotic sequences, a mesmerizing music score and soundtrack, and a rapturous story about identity and alienation. It’s a film that bear a lot of the hallmarks expected from Antonioni but it is also very intimate film in its exploration of a filmmaker trying to find the ideal woman in both life and in film as he wanders around a world that is ever-changing. In the end, Identificazione di una donna is a sensational film from Michelangelo Antonioni.